Summary: In the tradition of I Know What You Did Last Summer and How to Get Away with Murder, five teens must overcome their paranoia in order to keep their teacher’s death a secret in this fast-paced suspense thriller. 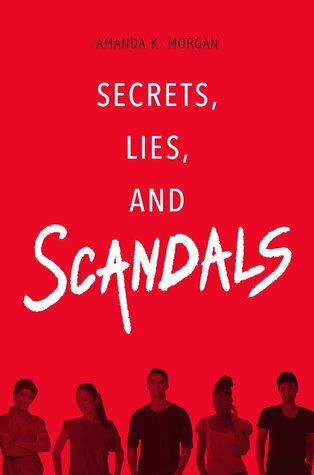 Review: I wanted to like Secrets, Lies, & Scandals more than I did, especially since I’m sure there will be many people who love it. A lot of my disappointment stems from specific-to-me pet peeves; other disappointments are less subjective. Amanda K. Morgan did an admirable job of giving the five students distinct voices and points of view in the alternating, sometimes fragmented story. Only Kinley and Cade are people of color, but they are allowed a proportionate amount of chapters. The strict adherence to the established chapter order (Ivy, Mattie, Kinley, Tyler, Cade) felt like a misstep on occasion, but the short chapters enhanced the overall pace of the book, as did the short timeline. Roughly three weeks pass between the death of their teacher and the end of the book, so there is little time to linger on anything—or really feel like characters or relationships are allowed to develop properly. Perhaps it is just my aro/ace self talking, but I just did not understand how two (two!) couples could (pseudo-)form under the stress of killing a teacher, disposing of the body, trying not to get caught, and contemplating throwing everyone else under the bus, but it happens in Secrets. (One of the characters does lampshade the fact that they’re making out approximately twenty feet from their teacher’s not-yet-cold corpse, but that just made me want to throw the book. Can we maybe put romance and hormones on hold for a couple hours? Please? There are actually more important things to be done and to worry about right now, I promise.) I wish both developing romances had been excised entirely in order to give more space for each character’s secrets/lies/scandals, because those were far more interesting, and some were woefully underdeveloped. The ending (and epilogue with a new narrator) is an exercise in frustration, where things are resolved too easily and then tanked at the last second (as a sequel hook?). Recommendation: Just skip it. While there are some good things about the premise and the writing, they were overshadowed by a number of pet peeves and representation issues.